Incense Divine Seven Chakra 15gm Box of 12 Divine Incense is made using traditional methods similar to Nag Champa style incense. The raw ingredients containing herbs, oil’s and gums and mixed together to make an incense resin and then hand rolled onto the bamboo stick. Only the finest raw materials go into making this product. It is very unique and not like any other. 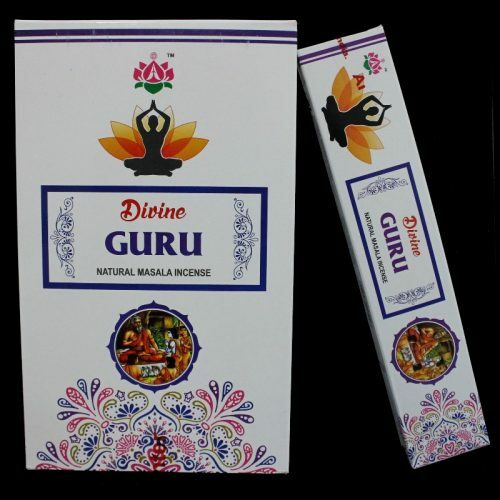 Incense Divine Guru 15gm Box of 12 Divine Incense is made using traditional methods similar to Nag Champa style incense. The raw ingredients containing herbs, oil’s and gums and mixed together to make an incense resin and then hand rolled onto the bamboo stick. Only the finest raw materials go into making this product. It is very unique and not like any other. Incense Divine Heena 15gm Box of 12 Divine Incense is made using traditional methods similar to Nag Champa style incense. The raw ingredients containing herbs, oil’s and gums and mixed together to make an incense resin and then hand rolled onto the bamboo stick. Only the finest raw materials go into making this product. It is very unique and not like any other. 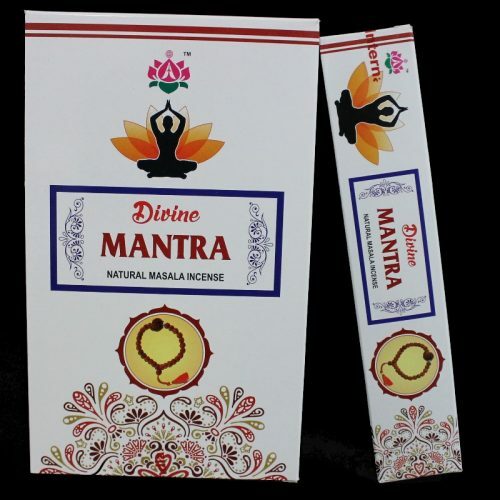 Incense Divine Mantra 15gm Box of 12 Divine Incense is made using traditional methods similar to Nag Champa style incense. The raw ingredients containing herbs, oil’s and gums and mixed together to make an incense resin and then hand rolled onto the bamboo stick. Only the finest raw materials go into making this product. It is very unique and not like any other. 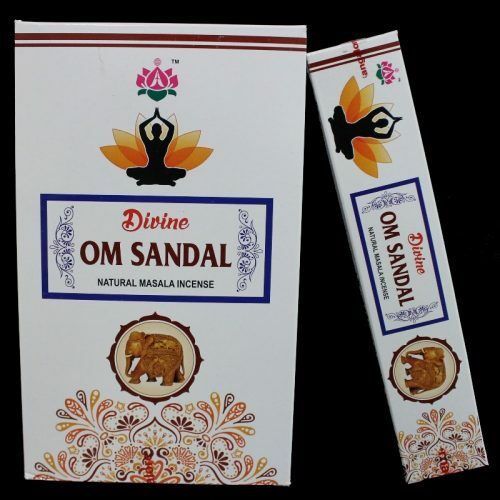 Incense Divine Om Sandalwood 15gm Box of 12 Divine Incense is made using traditional methods similar to Nag Champa style incense. 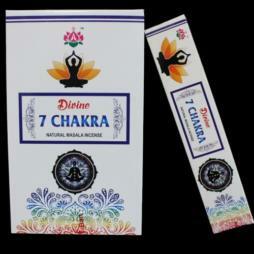 The raw ingredients containing herbs, oil’s and gums and mixed together to make an incense resin and then hand rolled onto the bamboo stick. Only the finest raw materials go into making this product. It is very unique and not like any other. 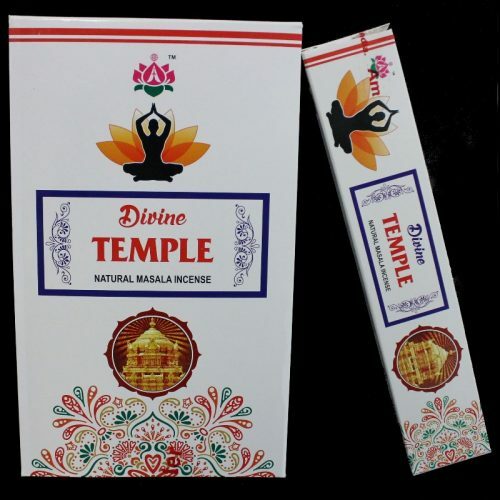 Incense Divine Temple 15gm Box of 12 Divine Incense is made using traditional methods similar to Nag Champa style incense. The raw ingredients containing herbs, oil’s and gums and mixed together to make an incense resin and then hand rolled onto the bamboo stick. Only the finest raw materials go into making this product. It is very unique and not like any other. Incense Divine Wisdom 15gm Box of 12 Divine Incense is made using traditional methods similar to Nag Champa style incense. The raw ingredients containing herbs, oil’s and gums and mixed together to make an incense resin and then hand rolled onto the bamboo stick. Only the finest raw materials go into making this product. It is very unique and not like any other. Incense Divine Tulasi 15gm Box of 12 Divine Incense is made using traditional methods similar to Nag Champa style incense. The raw ingredients containing herbs, oil’s and gums and mixed together to make an incense resin and then hand rolled onto the bamboo stick. Only the finest raw materials go into making this product. It is very unique and not like any other. Incense Divine Yoga 15gm Box of 12 Divine Incense is made using traditional methods similar to Nag Champa style incense. The raw ingredients containing herbs, oil’s and gums and mixed together to make an incense resin and then hand rolled onto the bamboo stick. Only the finest raw materials go into making this product. It is very unique and not like any other.